The Tod House is located at 2564 Heron Street. A formally designated heritage property, Tod House was the home of John Tod, Hudson's Bay Company (HBC) Factor, Chief Fur Trader at Kamloops, and one of the first appointed members of BC's Legislative Council. Tod farm was a significant early farm servicing the newly established Fort Victoria, and was one of the original 5 farms created by the subdivision of the Oak Bay HBC lands. 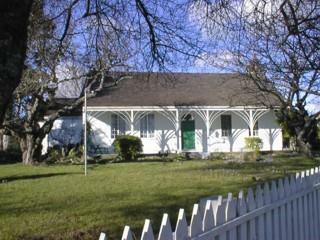 The home was built by John Tod in 1850, and expanded in the 1860's; it is significant as an example of an early HBC farm settlement of the French Canadian style, piece-sur-piece construction. This is one of the oldest houses in Victoria and notable as the longest continuously occupied residence in western Canada. Still largely intact, interesting original features include the original interior hand-hewn finish and the field stone fireplaces. Tod House is still an active residence; the house and surrounding properties are not open to the public.